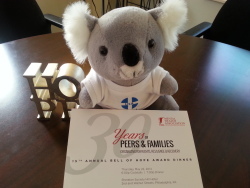 ALGEE is getting ready to go the MHASP's Bell of Hope award dinner with MHFA all-star Instructor June Cairns! Learn more about the Bell of Hope awards - /bell-of-hope/. ALGEE, the Mental Health First Aid mascot, and mnemonic for the 5-step action plan.